Thank God for Andre. Without him, my friend Christina and I would have had an incredibly frustrating time making our way through Bulgaria. More importantly, we would have missed out on one of the most prized experiences of our entire trip. We met Andre and his friend Gustav on our flight from Berlin to Sofia and ended up traveling with them for over a week. Andre just happened to be fluent in Russian, which was spoken (albeit somewhat reluctantly - gee, I can't imagine why) by many people throughout Bulgaria. Without him, we never would have been able to communicate with a man on the street corner standing nonchalantly next to a folding table complete with a guinea pig sitting contently on a newspaper-covered dinner plate. We saw him from across the street smack in the middle of downtown Sofia. Andre promptly sauntered over with the rest of us on his heels. We listened to their conversation in Russian, hoping the man wasn't angry. Russian always sounds angry. Andre turned to us to translate. "He says it's a fortune-telling guinea pig. We pay him, and the pig tells us our future." 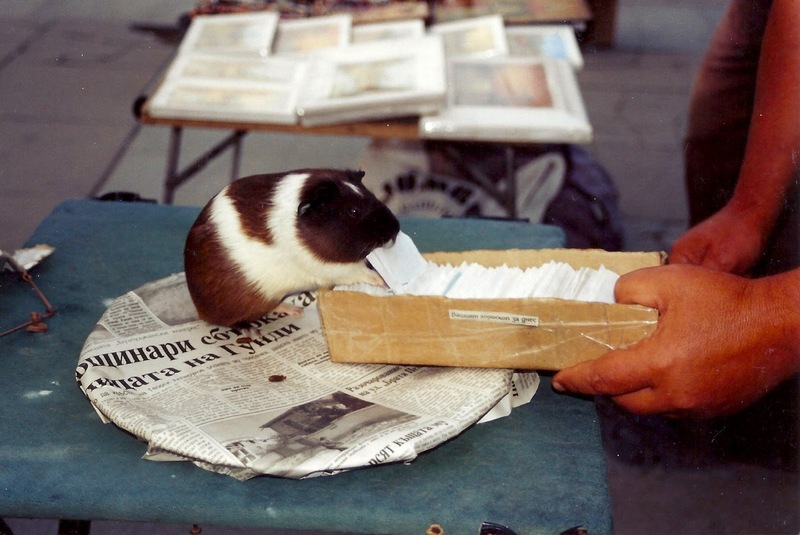 Who needs the Nevsky Cathedral when you can get a guinea pig to predict your future? We paid out the hefty sum of about 25 cents. The man pulled out a box of of cards wrapped in very thin paper, very similar to that box of cards containing the god-awfully impossible questions in Trivial Pursuit. He held the box in front of the guinea pig. The pig leapt onto it and began to rifle through the cards with his front legs. He suddenly stopped, bit down onto a single card with his teeth, and pulled it out for the man to take. He unwrapped the divinely inspired/randomly selected card and proudly presented it to us. What did our future hold? Well... we'll never know. The card was written in Bulgarian. But we didn't care in the least that our future was still a mystery. It had been foretold by a rodent, and that was all that mattered. If I ever visit Bulgaria, you can bet I'm finding that street-corner man and his prognosticating guinea pig. Hey, I had THREE guinea pigs and none of them ever did that! Not fair. Aaron - I highly recommend it! I never imagined that a guinea pig would have such a lasting impact on me :) Betsy - you must not have had a Bulgarian guinea pig! Did you snap a picture of the card? You could have someone to translate it. Now I feel guilty about my desire to eat one of those, I'd hate to eat a psychic Guinea pig. Unfortunately, I was not quick enough to think of that. I think I got my 25 cents worth out of the deal, though! This is so amazing, a fortune telling guinea pig! I really would love to take a trip up to Bulgaria and find this charming guinea pig ;) I just had to comment on this post as it really made my day. And I am so curious to know what was written on your card ;) Great post! The trip there is worth it! The guinea pig was great, but it's nice to know there's much more to Bulgaria than rodents showing off their crazy skills. I just looked at your colleague's blog - what a neat trip! I've long been fascinated by the Trans-Siberian Railroad and think it would be fun (though slightly maddening) to take the trip from China to Russia - or vice versa. If he's still in Russia, I hope he's having a grand time!